With three researchers, I conducted a qualitative usability study on how people use wearable devices and related apps for weight management. This project was sponsored by Samsung Research America, Mobile Innovation Lab. 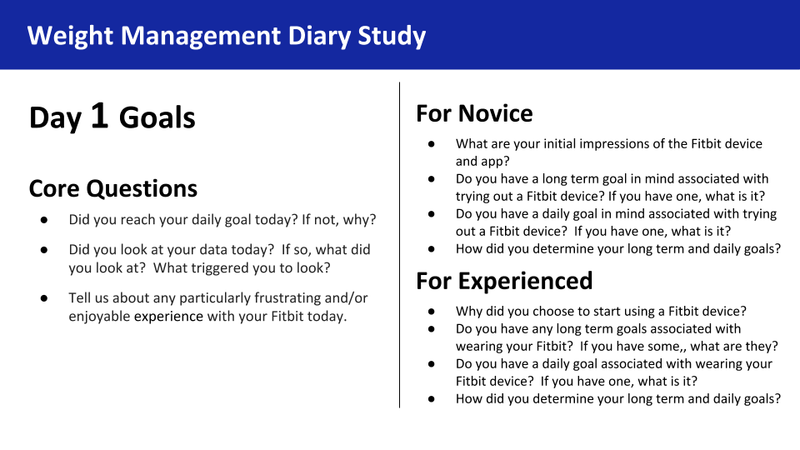 Through a diary study, we investigated how experienced and novice users incorporated Fitbit into their lives over one week, and analyzed how they differed. 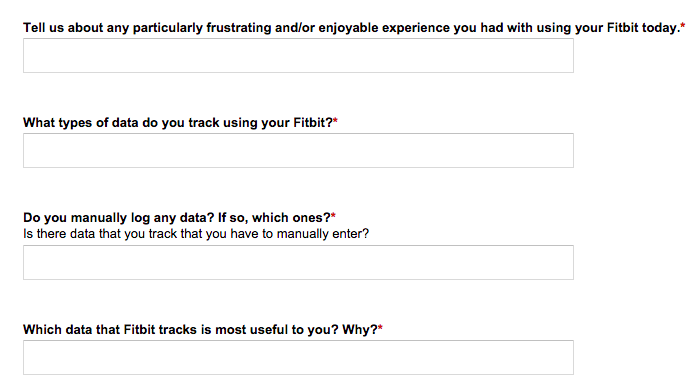 Our primary goal was to understand why users continue to use Fitbit and why they stop. The objective was to inform Samsung on their development of new tools and services for managing weight and preventing chronic diseases. Understanding the efficacy and usability of current tools and services was critical to that objective. 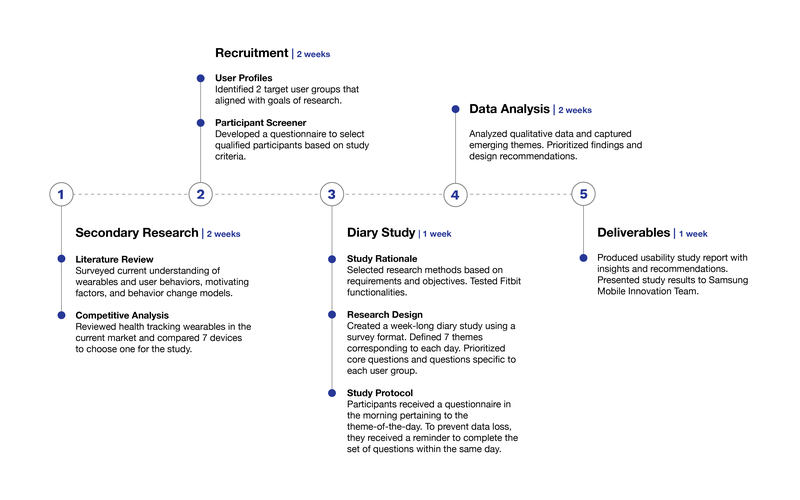 The R&D team at Mobile Innovation Lab used our study results to inform their future exploration and product strategy. Due to the NDA (non-disclosure agreement), I will only include our method and approach. Specific findings and recommendations are excluded. My contributions: Literature review, competitive analysis, screener design, and data synthesis. Research Lead for day-to-day study implementation. 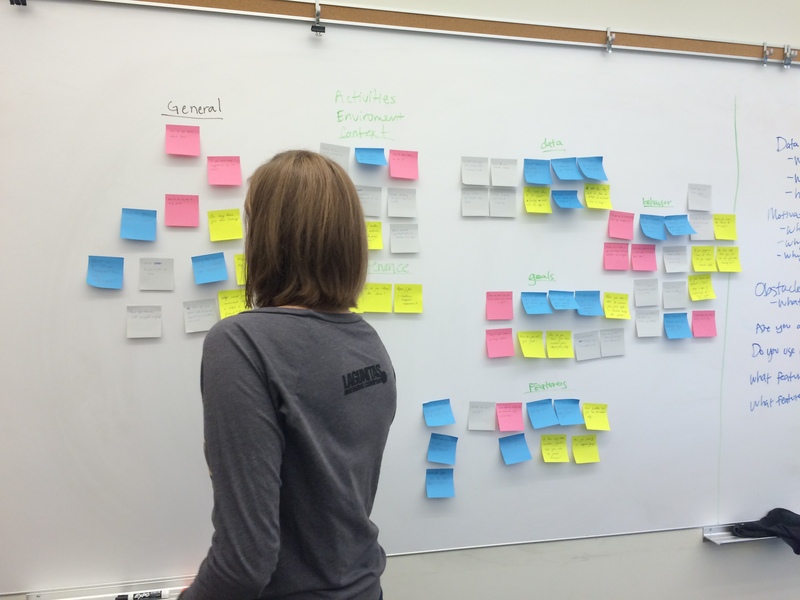 Kim grouping motivations of user subgroups during affinity diagramming. In the U.S., over 29.1 million people had diabetes in 2014, and about 600,000 Americans die from heart disease each year. (Source: National Diabetes Statistics Report, 2014) Obesity is a major contributor to both diabetes and heart disease, which means effectively managing one’s weight is critical to improving health and wellness. Our stakeholders at Samsung Research America were interested in studying how people use emerging technologies for weight management, which ones resonate with them, and why. In particular, they were interested in comparing different approaches to weight management and what factors influence long-term user retention. Why people start using tools to track their health? How they use tools to track their health? What motivates them to continue tracking their health? What obstacles they encounter in track their health? We determined that a diary study on wearable device usage would help us understand the emerging behaviors within the burgeoning tracking device market. The case for diary study: It was well suited to collect data on behaviors embedded in everyday life (i.e. “in the wild”) that would be more difficult to uncover through in-lab interviews. We surveyed 11 academic papers and conducted online competitive analysis of 7 wearable devices on the market to inform our study plan. I was the lead for researching relevant papers and industry reports. As a group, we selected Fitbit Flex to use in our study based on its sales, marketshare, and feature set. We segmented our audience based on their motivations for managing weight, and developed user profiles in order to identify our target population. We created an online screener, and relied on convenience sampling for recruitment. We selected a total of 10 participants: 5 experienced users and 5 novice users. I was responsible for the online screener while my team focused on recruiting. We constructed our 7-day diary study in which participants received daily prompts through email. The prompts contained a set of same core questions and a set of variable questions specific to each participant group. I co-facilitated writing sessions for our daily prompts by helping our team prioritize what we want to learn. Each day of the study covered a different theme regarding device use. We avoided event- and signal-contingent protocol to allow more flexibility for participants to record their responses. I was responsible for sending out daily prompts and reminders for the study while my team collected responses and performed personal follow-ups. Example diary study questions for Day 1: understanding user goals. All members collaborated on coding each participant response. Collectively, we grouped these codes based on relationships to each other to let natural categories emerge. Our analysis produced 4 main themes out of 490 codes. We conducted 4 post-study interviews with participants whose responses were particularly interesting. The purpose of these interviews was to explore outliers whose reasoning could challenge our current understanding of diary study results. 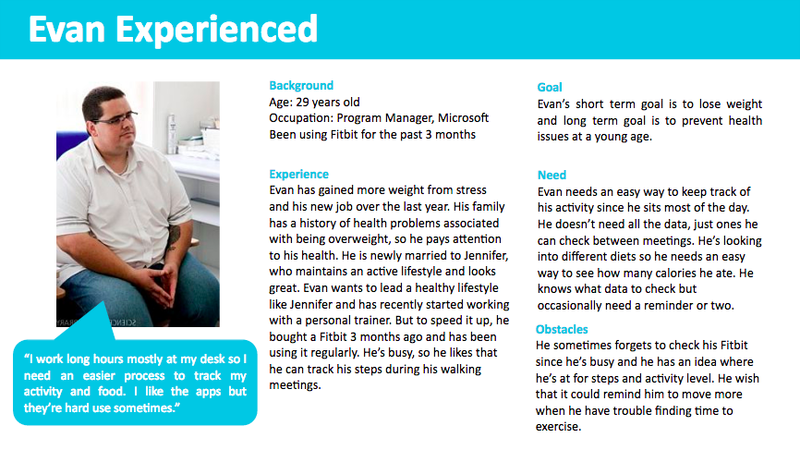 Our team conducted these interviews while I continued to analyze our findings. We produced 11 findings, each with an incidence rate and 1-2 representative quotes from novice and experienced participants. From those, we came up with 9 high-level recommendations that operationalized our findings. Our team delivered a final presentation to the user research and design team in the Samsung Mobile Innovation Lab. The biggest lesson I learned was to get buy-in for the research design prior to planning for execution. Since this was a generative research study, the challenge was learning how to properly scope a study so we could execute it within our constraints. Otherwise, we might delay the timeline based on stakeholders’ inputs. Another lesson is to communicate research findings at an appropriate level of detail. I learned to consider the audience at every stage of the research process. This is done to ensure that our recommendations were relevant to the decisions that stakeholders would have to make.